Aboriginal and Torres Strait Islander (Indigenous) Australians represented approximately 3% of the Australian population in 2016, and have an age structure which is notably younger than for the overall Australian population.1 To allow us to make comparisons across population groups which have different age structures, such as Indigenous Australians and Other Australians, there are a number of ways in which the data can be adjusted to take these into consideration. In order to provide context for cancer surgical treatment activity for the top 5 incidence cancers for Indigenous Australians, the data is presented below in three ways to adjust for the differences in population structure. How many separations would be expected for Aboriginal and Torres Strait Islander Peoples if they had the same rate of hospital separations as all Australians? This analysis compares whether the actual number of hospital separations (observed separations) would be the same as the number of hospital separations for these population groups if they had the same separation rates as a standard reference population (All Australians)4. This is referred to as expected separations. The number of observed and expected separations for each population group (Indigenous and Other Australians) for each cancer type are presented below (Table 1). A ratio of less than 1.0 suggests that a population group has fewer separations than would be expected if they had the same separation rate as All Australians. Breast cancer with 892 observed separations compared with 1,516 expected separations; ratio of 0.59. Colorectal cancer with 484 observed compared with 536 expected; ratio of 0.75. Melanoma with 166 separations observed compared with 797 expected; ratio of 0.21. Prostate cancer with 268 observed compared with 691 expected; ratio of 0.39. This indicates that for these four cancers, Indigenous Australians had relatively less hospital separations than for All Australians. 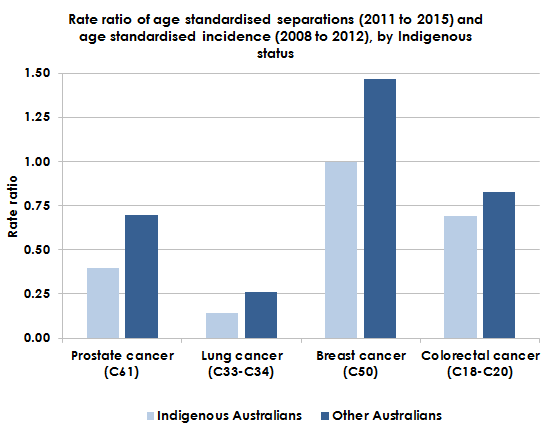 For lung cancer however, this comparison indicates that Indigenous Australians had a similar number of hospital separations (146) to that which would be expected (141) if this group had the same separation rate as All Australians (ratio of 1.04). What hospital separation rates would be expected for Aboriginal and Torres Strait Islander Peoples if they had the same age structure as All Australians? Indigenous Australians have an age structure which is notably younger than for the overall Australian population. As age is strongly related to cancer diagnoses, it is especially important that comparisons should take these differences into account. Adjusting for the differences in age structure (age standardised rates) are a way of estimating the separation rate for population groups (Indigenous and Other Australians) if they had the same age structure as the standard population (All Australians)4. The following section presents the estimated separation rates by cancer type for these population groups if they had the same age structure. Breast cancer (94.2 per 100,000) compared with Other Australians (161.2 per 100,000). Colorectal cancer (35.5 per 100,000) compared with Other Australians (47.2 per 100,000). Melanoma (10.0 separations per 100,000 people) compared with Other Australians (48.8 separations per 100,000 people). Prostate cancer (42.3 per 100,000) compared with Other Australians (109.7 per 100,000). For lung cancer however, after adjusting for the differences in age structure, Indigenous Australians had a slightly higher separation rate for lung cancer-related procedures (11.2 per 100,000) compared with Other Australians (10.8 per 100,000). Melanoma (C43) 10.0 n.p. . 48.8 n.p. .
Data sourced from the National Hospital Morbidity Database (NHMD). Data on Indigenous status are considered to be of sufficient quality for analysis purposes for New South Wales, Victoria, Queensland, South Australia, Western Australia and the Northern Territory (public hospitals only). “Other Australians” includes separations for which Indigenous status was not reported. Separations are for patients with a principal diagnosis of specified cancer (refer to ‘About the Data' for ICD codes). Surgical treatment activity is for key selected procedures for the primary treatment, symptom relief or palliative care of the relevant cancer type. Refer to 'About the Data' for a full list of procedure codes, inclusion and exclusion parameters. Expected numbers are based on the indirect age standardisation method. ‘Ratio’ represents the ratio of the number observed separations for key selected procedures to the number of expected number of separations if the study population separation rate as the standard population. Age standardised incidence rates sourced from AIHW: Cancer in Australia 2017. Note that these rates include cancer diagnoses by Indigenous status for all Australian jurisdictions. ‘Rate ratio’ represents the ratio of the indirectly age standardised separation rate (2011 to 2015) to the directly age standardised incidence rate (2008 to 2012). Refer to 'About the Data' for details on the methodology for calculating these estimates. How do hospital separation rates for Aboriginal and Torres Strait Islander Peoples align with the rate of cancer diagnosis in this population group? The number and type of surgical procedures for the treatment of different cancer types and the frequency of individual cancers in a population group will vary. To allow for these differences and provide additional context for the hospital separations within each population group, the amount of hospital separations (rate of hospital separations) were compared with the annual rate of new cancer diagnoses (incidence) for each for each population group (Table 2). This is not a direct comparison as an individual may have more than one procedure type in a given year, but it does provide an indication of whether hospital separations are relatively high or low when compared to incidence. Therefore, a ratio of close to 1 suggests that hospital separations for a particular cancer type are approximately aligned with the incidence rate for that cancer. Colorectal cancer (ratio of 0.69) compared with Other Australians (ratio of 0.83). Lung cancer (ratio of 0.14) compared with Other Australians (ratio of 0.26). Prostate cancer (ratio of 0.40) compared with Other Australians (ratio of 0.70). For these three cancer types, although both population groups had a ratio less than one, the ratio for Indigenous Australians as a population group was lower than Other Australians. For breast cancer, the age standardised separation rate was consistent with the incidence rate for Indigenous Australians (ratio of 1.00). For Other Australians, the rate of hospital separations for breast care was higher than the incidence rate (ratio of 1.47). Data for melanoma was not available for Indigenous Australians and Other Australians. The data presented here provide an overview of indirectly age standardised separation rates for Indigenous Australians and other Australians. These rates were derived by multiplying indirectly age-standardised ratios for these groups by the respective crude rate for a common standard reference population. The ratios were the numbers of separations observed in the respective group divided by the numbers expected for that group from its age-distribution and the age-specific rates of the common standard population. The age-specific rates for the standard population used in this report were those for all patients in Australian hospitals with a principal diagnosis of the relevant cancer. Data were aggregated for the years 2011 to 2015 inclusive to calculate age standardised ratios of surgical treatment. Not all surgical procedures were included. More information about the scope, data sources and methodology for calculating age standardised separation ratios can be found in the ‘About the Data’ and definitions of key terms are provided in the ‘Glossary’ tab. This measure focuses initially on the five highest incidence cancers in Australia: prostate, breast, colorectal, melanoma and lung. Indigenous Australians represented around 3% of the Australian population in 2016, and have an age structure which is notably younger than for the Australian population overall.1 As age is strongly associated with diagnosis, comparing the cancer related hospital separations for these groups without taking into account differences in age structures is potentially misleading. When examining data for Indigenous Australians, data is presented using age standardisation ratios which are obtained for Indigenous and other Australians, respectively. In this report this is calculated by dividing the number of observed separations for each group by the number that would have been expected for that group from the same age-specific rates (those for the total population). These ratios are multiplied by the common crude rate for the total population to give the indirectly standardised rates. Due to the smaller population size and therefore the numbers of procedures for the Indigenous population, this analysis shows indirectly age-standardised ratios for key selected surgical procedures for admitted patients with a principal diagnosis of the relevant cancer for the five-year between 2011 and 2015. Indirectly age-standardised rates are presented for Indigenous Australians and other Australians respectively. The observed separations are the actual number of separations for key selected surgical procedures for admitted patients with a principal diagnosis of the relevant cancer for the five-year between 2011 and 2015. The expected separations are an estimate of the number of separations that would be expected for each of the population groups (Indigenous/ other Australians) if they had the same age-specific separation rates as the standard population (all Australians). Ratios of the observed and expected separations indicate whether a population group has more (or fewer) separations that would be expected if they had the same separation rate as all Australians.. Indirectly age standardised rates are an estimate of the separation rate for these population groups (Indigenous and Other Australians) if they had the same age structure as the standard population (all Australians). These are obtained by multiplying the ratio of the observed and expected separations by the crude rate for all Australians. For comparison, indirectly age standardised incidence rates were calculated and there were no notable differences in the rates (and rate ratios) calculated using the direct or indirect method. Age standardisation refers to a method of adjusting for differences in age structure when comparing different populations. This is often necessary as diagnosis and separation rates are strongly related to age. There are two methods for calculating age standardised rates: direct and indirect standardisation. Age standardised separation ratios are based on the aggregated number of separations for the 2011 to 2015, inclusive. For the purposes of this calculation, the age groups used for standardisation were: 0-39 years, 40-44 years, 45-54 years, 55-59 years, 60-64 years, 65-69, 70-74 years, 75 years and over. For these analyses, confidence intervals have not been included due to lack of independence between observations. Nonetheless, the point estimates provided are regarded as indicative of the direction of differences between indigenous and other Australians. NHMD data on Indigenous status are considered to be of sufficient quality for analysis purposes for New South Wales, Victoria, Queensland, South Australia, Western Australia and the Northern Territory (public hospitals only). Data for “Laparoscopic right hemicolectomy with anastomosis” procedures (ACHI code 32003-03) with a principal diagnosis of colorectal cancer (C18-C20) were unavailable by Indigenous status. To allow for comparisons between these groups to the standard population (all Australians), these procedures have also been excluded from the number separations for the standard population. Expected number of separations and separation rates were obtained by applying standard age-specific rates for the reference population to the age-distributions of the relevant groups being studied (Indigenous and other Australians). Directly age standardised incidence rates were sourced from the AIHW Cancer in Australia 2017 and include cancer diagnoses from all jurisdictions. Rate ratios will therefore be an underestimate of the true figure as separation data from the NHMD by Indigenous status are not available for the Australian Capital Territory and Tasmania. 1. Australian Bureau of Statistics 2017. Census of Population and Housing: Reflecting Australia - Stories from the Census, 2016. ABS cat. no. 2071.0. Canberra: ABS. 2. Australian Institute of Health and Welfare 2017. Admitted patient care 2015–16: Australian hospital statistics. Health services series no. 75. Cat. no. HSE 185. Canberra: AIHW. 4. Australian Institute of Health and Welfare 2011. Principles on the use of direct age-standardisation in administrative data collections: for measuring the gap between Indigenous and non-Indigenous Australians. Cat. no. CSI 12. Canberra: AIHW.